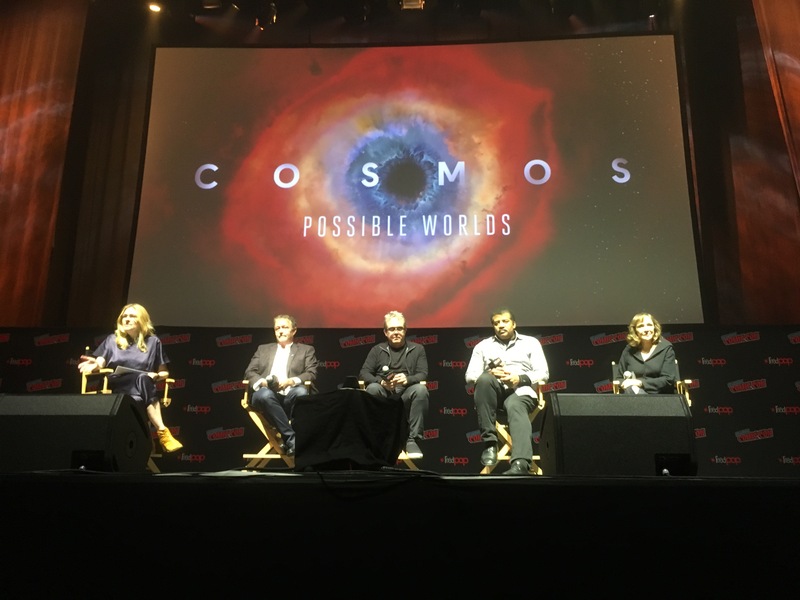 NYCC 2018: Neil DeGrasse Tyson to explore two futures for humanity in 'Cosmos: Possible Worlds' – AiPT! What will the future be like for children born today? “Knowing our place in the universe can change everything,” Neil DeGrasse Tyson said at the Cosmos: Possible Worlds panel at New York Comic Con this Sunday. Tyson was joined on the panel by series writer/producer Ann Druyan, widow of Carl Sagan (creator of the original Cosmos), and executive producers Brannon Braga (Star Trek: The Next Generation, The Orville) and Jason Clark (The Orville). The group laid out their mission for the new season, showing the audience different possible futures for humanity. At least one episode will follow the life of a child born in 2019 through two distinct realities, one in which we combat climate change and use the tools of science to serve the world, and another in which we don’t. How will that child’s life be different if we don’t address climate change from how it would be if we do? “It’s a kind of monologue to this baby as we inch into the future,” Druyan said. The show will continue to tackle a variety of other subjects, as well. In one upcoming episode, Tyson will explore the mycelium network in mushrooms that connect the roots of different plants together, allowing them to communicate, a difficult thing to show on screen. “We feel privileged that we have access to that level of talent,” Tyson said of the high production value given to the new season and the number of artists who have gotten involved out of love for the project. One issue that particularly plagues Tyson is the decline in space exploration. He was born the same year NASA was founded, and was 10-years-old when man landed on the Moon. But we never built on that achievement nearly as much as the child Tyson dreamed. The “Golden Age” of space exploration only existed for a decade, from about 1963 to 1972. Tyson says it’s like we had a taste of the future, and then it was gone again. We should never look to the achievements of 50 years ago and ask how we did it, Tyson says. Cosmos: Possible Worlds premieres on Fox and National Geographic in Spring 2019.